The Iowa State Medical Entomology Lab is the central location for monitoring diseases transferred from insects to humans. Wayne Rowley, professor of entomology, began monitoring mosquitoes in Iowa in 1968 after a child in Wisconsin died of a mosquito-borne illness. The program expanded to become the Medical Entomology Lab and has been used to monitor West Nile virus since 2001. 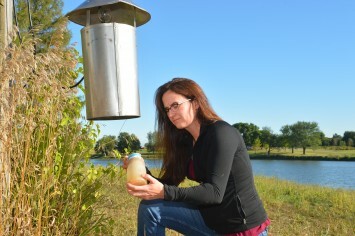 Lyric Bartholomay, professor of entomology, took over the lab in 2006 and coordinates mosquito surveillance each summer. The lab sends reports alerting state health agencies if mosquitoes are carrying West Nile virus, allowing them to implement mosquito control measures and warn the public. The medical entomology group studies both mosquito-borne and tick-borne diseases in Iowa through collaborative surveillance projects. In addition, the lab focuses research efforts on molecular interactions between mosquitoes, ticks and pathogens. Researchers began testing catnip oil as a possible repellent against mosquitoes carrying West Nile Virus in 1998. Joel Coats, entomologist, and Chris Peterson, a graduate student, found that catnip oil repels mosquitoes significantly better than the compound used in most commercial bug repellents. Nepetalactone, the primary active ingredient in catnip oil, has been patented by ISU. The catnip plant is a perennial herb in the mint family and grows wild in most parts of the United States. The doses tested contain 1 to 5 percent of the essential oil. Catnip oil is too strong to put directly on skin.